Chlorine dioxide has many industrial applications including water purification, food and surface disinfection, mold eradication, and anthrax decontamination. In fact, chlorine dioxide is one of three disinfectants approved by the US Environmental Protection Agency (EPA) for municipal water systems and drinking water in general. Chlorine Dioxide is registered as a biocide by the EPA. Chlorine Dioxide is so commonly used in food disinfection and water purification that many of us consume it daily without even realizing it. Another company supplying Chlorine Dioxide products is the UK based Safe Ox. Their website claims: “Chlorine Dioxide is a highly potent, fast acting bactericide and virucide at concentrations as low as 0.1 ppm. It does not form toxic by-products, is effective over a wide pH range in both hard and soft water; and does not react with most other water treatment chemicals and so leaves no residual toxicity. Because most companies providing chlorine dioxide technologies only offer them on a commercial scale, MMS was created to provide chlorine dioxide on a smaller scale for consumer use through onsite/at home chlorine dioxide generation. The chemical sodium chlorite (NaCl0₂) is recognized as a solid form of chlorine dioxide which is easier to transport and use than chlorine dioxide gas. Technical grade sodium chlorite (TGSC) is by definition 80% sodium chlorite and 20% other inert components. chlorine dioxide (see ch. 4 of the EPA’s “Alternative Disinfectants and Oxidants Guidance Manual” section 4.2.3 in our EPA documents section). Water itself can activate sodium chlorite but the process is slow. To speed the process, WPS4sale.com offers two different acids to accomplish this activation in a speedier way. We have a 50% citric acid (CA) activator and a 4% hydrochloric acid (HCl) activator. 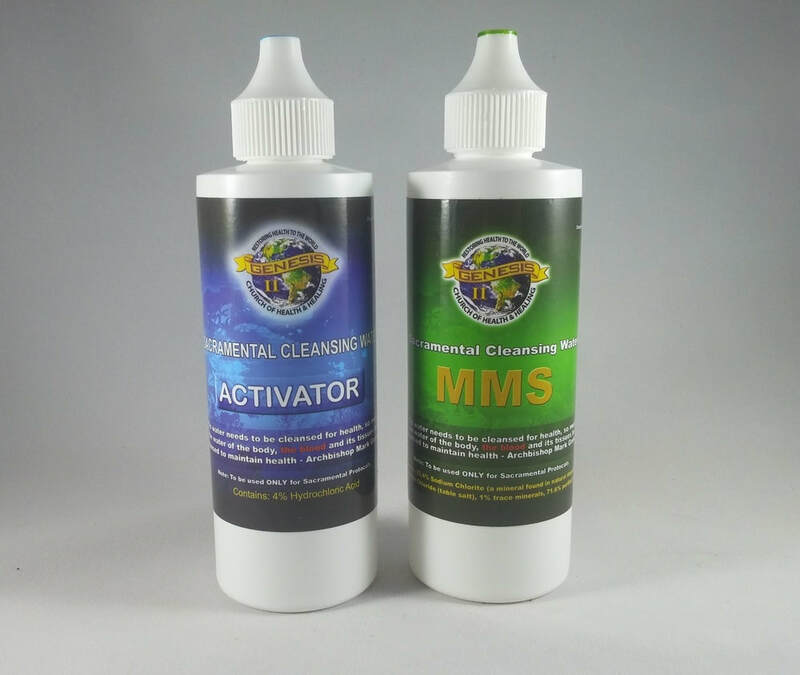 Both activators are mixed in a 1 to 1 (1:1) ratio with the MMS solution to form the chlorine dioxide. The acid and MMS are combined in a 1:1 ratio then allowed to sit 30 to 60 seconds or longer before being added to water. The HCl and WPS are combined in a 1:1 ratio then allowed to sit 30 to 60 seconds or longer before being added to water. Once activated, MMS can be used for a variety of applications. First and foremost among these is water purification. 1 to 12 activated drops of MMS can be used per gallon of water depending on the quality of the water. More cloudy or questionable water would require more drops. Another use is food preparation. Add 10-15 drops of activated MM to a pot of rinse water to rinse leafy greens or clean any other produce. As a scrub, activate 5-10 drops of WPS and add to a half cup of water. Use this solution to rub firmly onto the surface of a fish fillet, chicken breast, steak, or other meat item. Allow the solution to stay on the surface of the meat for a few minutes, then rinse off. As a soak, activate 5-15 drops of WPS and add to enough water to cover your meat items in a dish or pan. Submerge your meat items in the WPS solution for a few minutes. When you are ready to use the meat, rinse it off and drain the rinse solution. Use a mild WPS and water solution to disinfect sponges, countertops, sinks, and cutting boards. MMS can be added to your loads of laundry to wash mildew out of washable clothing and fabrics. Wet the mildewed section of fabric and scrub in liquid or powdered detergent onto the area. Then wash the fabric in warm water. Activate 30 to 60 drops of WPS and add to the wash water instead of bleach. No trihalomethanes form in your wash water, and the WPS solution does not wear your clothing down the way industrial bleach products do. shower mat and shower curtain to remove mildew buildup. A strong WPS and water solution can also remove mildew and stains on cement, brick, stone, and other outdoor surfaces. Use a wire brush to scrub WPS and water onto patio stones, foundation walls, or exposed concrete surfaces. The shelf life of WPS in bottles if kept dry, cool, air tight and out of sunlight is considered to be 5+ years. 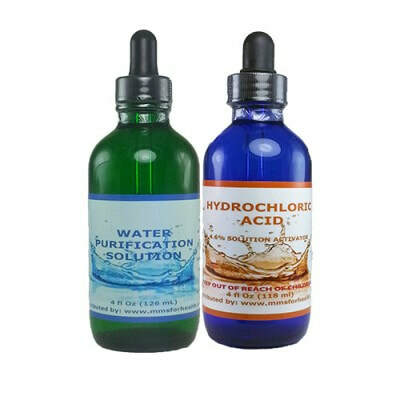 The citric acid solution and hydrochloric acid solution in bottles appears to be the same in our experience. Sodium chlorite flakes and citric acid powder may last up to 20+ years if stored correctly. Finally, WPS4sale.com offers the following sections to compare two refined chlorine dioxide products with WPS, namely Chlorine Dioxide Holding Solution (CDH) and Chlorine Dioxide Solution (CDS). Below is a comparison of the three products (WPS, CDH, CDS) for onsite chlorine dioxide generation. MMS – 28% sodium chlorite solution fast activated (less than 1 minute) using acid on a 1:1 ratio. Chlorine dioxide is a highly reactive molecule that is best generated at the point of use. Sodium chlorite, or WPS, in an unactivated state provides a safe, stable compound that can be combined with an acid on site to generate chlorine dioxide at its point of use. WPS does not need to be refrigerated and will not lose its chlorine dioxide over time. WPS and the acids used to activate it can be effectively stored for long periods. Both CDH and CDS will lose their chlorine dioxide because they are based on released chlorine dioxide (activated sodium chlorite) whereas WPS’s chlorine dioxide is still only a potential within the sodium chlorite because it has not been activated. One activated drop of WPS is still probably the safest, quickest, lowest cost and most effective water purifier available today. CDH – Slow activated (12-24 hrs.) MMS that allows the sodium chlorite to become fully activated and all of the chlorine dioxide to be released and immediately available in the suspension. Where WPS continues to activate after being added to water, the CDH is more fully activated. This is the step in between WPS and CDS. CDH is easier to produce than CDS and contains the reaction by-products which may be useful depending on your application. The acid used for activation could make a difference in the final CDH produced, depending on the sensitivity of your application. MMS – 1 to 5 activated drops will purify one gallon of water. The number needed is determined by the state of the water being treated. Stagnant water, cloudy water, or water of an unknown source may require more rather than fewer drops. CDH – 18 drops of CDH at 3000 part per million (ppm) can be considered the roughly equivalent to 1 to 3 activated drops of WPS. Therefore 18 drops of CDH at 3000 ppm will purify 1 gallon of water. 1 ml of CDH is equal to approximately 18 drops of CDH. A 4 oz. bottle of CDH has 120 ml in it and approximately 2160 drops. This ratio changes as the CDH concentration changes. For example, if the CDH has a concentration of 6000 ppm then the number of drops needed would decrease by half. Basically, as the ppm concentration of the CDH increases, the amount needed to accomplish the same purification decreases. The reverse is true also. If the CDH has a concentration of 1500 ppm then the number of drops needed would increases to twice as much. CDS – 18 drops of CDS at 3000 part per million (ppm) can be considered roughly equivalent to 1 to 3 activated drops of WPS1. Therefore 18 drops of CDS at 3000 ppm will purify 1 gallon of water. 1 ml of CDS is equal to approximately 18 drops of CDS. A 4 oz. bottle of CDS has 120 ml in it and approximately 2160 drops. This ratio changes as the CDS concentration changes. For example, if the CDS has a concentration of 6000 ppm then the number of drops needed would decrease by half. Basically, as the ppm concentration of the CDS increases, the amount needed to accomplish the same purification decreases. The reverse is true also. If the CDS has a concentration of 1500 ppm then the number of drops needed would increases to twice as much.